We’d love your help. 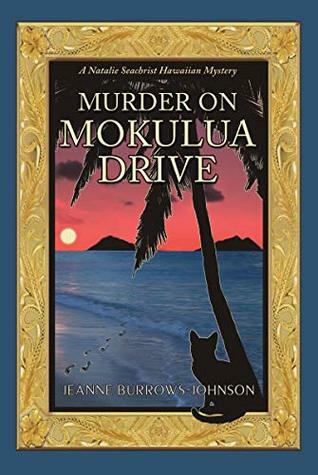 Let us know what’s wrong with this preview of Murder on Mokulua Drive by Jeanne Burrows-Johnson. A vision of a predawn escape by boat from Denmark seems confusing to Journalist Natalie Seachrist. She has no idea how scenes apparently from a World War II movie will impact her modern life in Hawai’i. Soon, she and boyfriend, private investigator Keoni Hewitt, move into the Lanikai cottage she recently inherited. The warm welcome they receive from Miriam Didión and her housemates sets an ideal tone for life in the seaside neighborhood. As Natalie throws Keoni a birthday party everybody, including Natalie’s feline companion Miss Una, have become fast friends. Abruptly, everyone’s life changes when a body is found at Miriam’s home. Eerily, the murder parallels another of Natalie’s visions of a scuba diver garroting a woman by moonlight. Natalie reveals the murderous vision to Keoni’s former partner, Honolulu Police Detective John Dias. Discovery of a suspect’s body on Diamond Head Beach suggests resolution of the crime and Natalie and her new friends relax. But a day of playing tourist devolves and Natalie and her friends are suddenly in the cross hairs of a dangerous adversary. To ask other readers questions about Murder on Mokulua Drive, please sign up. The scents of the Hawaiian Islands, where I lived from 1990-1996, are heady and constant, salty and sweet. I just finished reading Murder on Mokulua Drive and I’ve never missed Hawaii so much. When author Jeanne Burrows-Johnson told me that her main character commissions me to create one of my hand-painted aloha shirts as a surprise for her boyfriend, Jeanne didn’t give me a preview. Reading her description of my studio by the ocean, including the music, my dear Siamese cat who was born under my The scents of the Hawaiian Islands, where I lived from 1990-1996, are heady and constant, salty and sweet. I just finished reading Murder on Mokulua Drive and I’ve never missed Hawaii so much. When author Jeanne Burrows-Johnson told me that her main character commissions me to create one of my hand-painted aloha shirts as a surprise for her boyfriend, Jeanne didn’t give me a preview. Reading her description of my studio by the ocean, including the music, my dear Siamese cat who was born under my studio, and even my technique, was a gift that did bring tears to my eyes. For anyone who has spent time in those islands, Jeanne Burrows-Johnson’s ongoing Natalie Seachrist mystery series are as welcoming as a plumeria lei greeting. And what an introduction to island life for those who have yet to experience it. Time really does run differently in Hawaii, and that is reflected in the ways you’ll get to know retired travel writer and amateur sleuth Natalie and her partners in crime-solving—Miss Una the cat, and Keoni, retired detective and Natalie’s lover. And then there’s the inherited cottage they move into in Lanikai, by one of the most beautiful beaches in the world. Whether you’ve ever been there or not, you won’t want to leave. The Natalie Seachrist mysteries are based on historical events that cross the seas and travel through time. With so many island residents landing there from around the world, it is appropriate that the characters’ stories include the countries and cultures from which the characters originated.